Light Design Ltd is pleased to announce that we will be taking delivery of the first allocated stock of the Martin Mac Krypton 575 fixture in the UK. Terry Lewsey MD for Light Design Ltd said “We are very excited to be the first company chosen to stock this impressive fixture giving us and our customer base the very latest in technology”. “This fixture will allow us to compete very competitively in the large scale events and installation sector with a fixture built on the reliable Mac 700 platform combined with krypton pricing this is sure to be a success for us”. “We owe a lot of our rapid growth and success to our relationship with Martin Professional, their dedicated team, reliable products and support they have given us in the last 2 years”, “We are excited about the new products Martin are bringing to production and feel, we can now take our relationship with them to a new level. As we bolster our stocks to over 100 Martin Mac fixtures available in rental stock for our customer base we can now add a mid ranged fixture bursting with features with a brand that is trusted in the industry”. 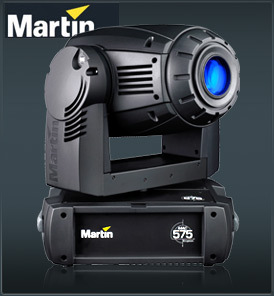 Clive Bailey of Martin Professional said ”Martin Professional is proud for Light Design Ltd in their decision to purchase The Martin Mac Krypton 575. This long awaited fixture complements the gap in our mid market sector. We are now looking forward to new and continued growth in the UK market with our full and complete product range after successfully launching the Smart Mac and Krypton 575 at PLASA this year. They will now sit perfectly in our range alongside our already industry standard Mac 700 and Mac 2000 fixtures. We are delighted to be working with Light Design Ltd, already one of our key players in the installation and hire market sector, and we wish them every success with their purchase”! Stock of this fixture will be arriving early December so for more information contact us for your hire or sales requirements today!